My name is Kristin Jess Rodin, and my age is 28. My job is to bring people closer to each other. My ambition is to get to work with as many cool people as possible, and - and this might be is a little cheezy - try to change the world into a better place, with the little I can contribute. It sounds brittle, but it feels like a duty we have whatever I do. My drive is getting to do something new, or something other than I've done before. I have to work with people who are better or different than me to make something really good for an audience. It's important to feel that I want to do something urgently, that´s how I know I am doing something that hopefully means something. I get inspiration and energy when I'm all alone. I want people around me all the time, but it is when I go for a walk or see a movie alone that things make sense to me or I see things in a new light. Nevertheless, I still have to talk it out with someone. Without a sparring partner, I would get nowhere. I may have passed up a great opportunity earlier, but I do not regret any of my choices so far. I have become much more confident in my intuition and sure of what I can handle when considering opportunities and jobs. Has it always been imporatant for you to have a career? I come from a family of mostly academics, so choosing the acting path, in addition to not having any formal education, is probably a choice I have made on my own. But my parents have been surprisingly proud of me doing something different than them, and I would like to keep them proud. Having a career has always been important to me. It is cool to see oneself building a career piece by piece. 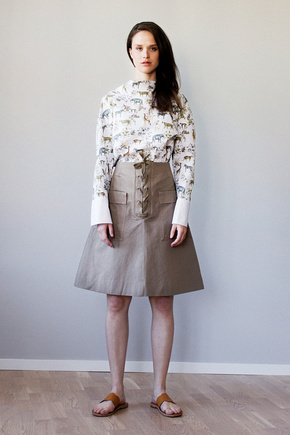 Kristin is wearing Skirt Brinda, Shirt Bimbi and Sandals Kath in the image above.